Photobucket has recently launched its new Stats Dashboard feature with which you can measure how many times your images and videos are seen on sites where you have shared them. 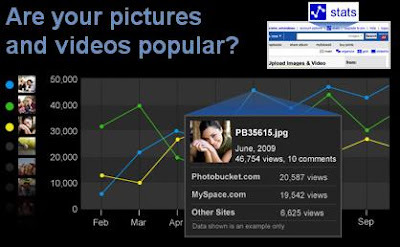 Whether its on Photobucket, Myspace, blogger, Facebook or anywhere else, you can analyze the popularity of your embed media with the total views and comments it has got using a detailed graph in your Stats Dashboard. The Stats Dashboard can be viewed for your individual files, albums and even for the whole account. But there are certain limitations in the stats you see if you are a Free photobucket user. Major limitations include Stats for only top 5 files in ‘Files Dashboard’ and Stats for only top 3 linking domains where your photos have been shared. Whereas with Photobucket Pro account, you can get more stats and utilize the full functionality of this Stats Dashboard with Stats on more than 100 files and views on upto 25 sites and much more. To access your Stats Dashboard, log into your account and click the Stats icon at the top right in your album.